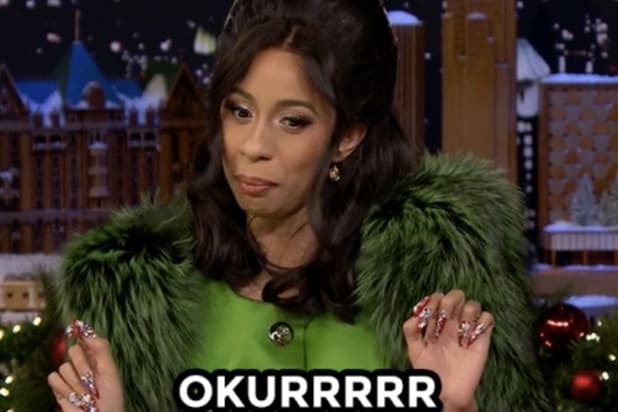 A GIF of Cardi B saying her famous catch phrase “Okurrr” has made it to the number one spot on GIPHY’s top GIFs of 2018. The GIF, which captures a portion of the rapper’s interview on “The Tonight Show Starring Jimmy Fallon,” has garnered more than 282 million views this year. Cardi B adds this accomplishment to her growing list of achievements in 2018, which include nabbing three AMAs, three VMAs and a BBMA. Following Cardi and coming in at number two, is a reaction GIF of the Colombian pop duo Alkilados for the 2018 FIFA World Cup. The one-second clip has attracted 269 million views since its creation. Taking the number three spot is the “Happy Party” Gnome from the 2018 animation “Sherlock Gnomes.” While the film scored a less than a 5.5 on IMDB and a 27 percent approval rating on Rotten Tomatoes, the GIF, which features the Happy Gnome dancing in a Borat-like bikini, attracted more than 268 million views — because who doesn’t love seeing a scantily clad garden gnome shaking what he’s got?